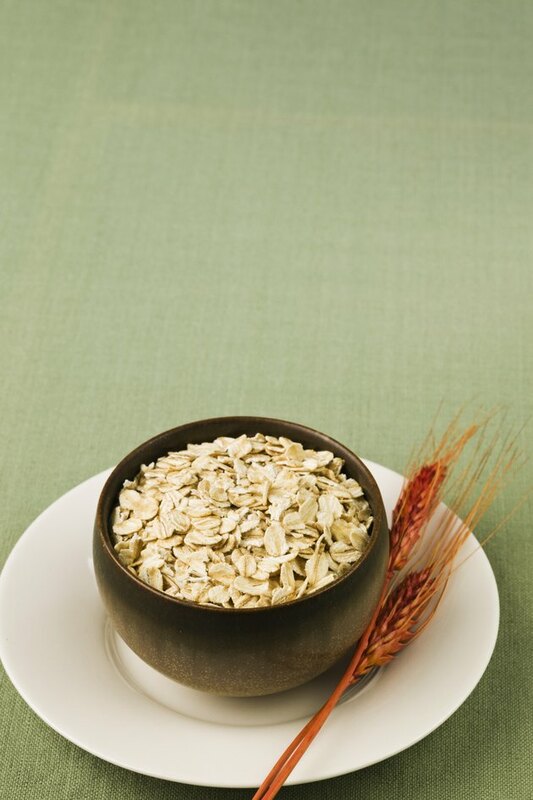 Oatmeal is a nutritious whole grain that can help lower blood cholesterol levels and aid in hunger control. The oatmeal diet is a low-calorie fad diet circulating the Internet touted as a weight loss diet that can also lower your risk of heart disease and cancer. The low-calorie diet may help you lose weight, which may make you feel less bloated. But the fiber in the oatmeal is more likely to cause bloating than remedy it. You can find a number of different takes on the oatmeal diet. In general, during the first week you eat 1/2 cup of oatmeal made with 1/2 cup of skim milk at each meal. During the first week, it is recommended that you use old fashioned plain oatmeal only and not instant. After the first week, you can start eating regular foods but continue to include 1/2 cup of oatmeal at each meal. You can also use instant oatmeal after the first week. Regular food choices include fruits, vegetables, chicken, fish, coffee, tea, club soda and sugar-free pudding. Overall, the diet limits your daily calorie intake to 900 to 1,300 calories a day, depending on which phase of the diet you are following. When you don't pass intestinal gas by belching or flatulence, you end up with a bloated feeling. It causes discomfort, but you can often get relief by passing gas or having a bowel movement. You can help prevent it by avoiding foods high in fat or foods that cause gas, including broccoli, cabbage, beans. Stress and smoking can also cause bloating, as can a gastrointestinal infection. Bloating is common in people with irritable bowel syndrome, lactose intolerance and celiac disease. Oatmeal contains soluble fiber, which isn't broken down until it reaches the large intestine, where digestion causes gas -- which can increase bloating. Many of the other foods allowed on the diet, including the fruits and vegetables, are also gas-producing and more likely to cause bloating than relieve it. The oatmeal diet may not reduce bloating, but making other changes to your diet may help. If bloating causes a lot of problems, you may want to limit your intake of high-fiber foods, and avoid gas-producing foods such as broccoli, cabbage, Brussels sprouts and apples. If you are lactose intolerance, you may want to avoid milk or use lactose-free milk instead. Drinking lots of water and getting regular exercise can also help. You can also try over-the-counter digestive aids to help relieve gas and bloating. Sharecare: Are There Alternative Treatments for Bloating?